Do you find yourself feeling self conscious all the time, are you being to hard and critical of yourself, do you spend to much time stuck in your own head analyzing, self assessing yourself, your situation and how your feeling and doing. Thinking is fine if it is constructive and beneficial, the trouble is we think to much, ask yourself what have you actually gained from all the negative repetitive thinking. You know you will lose nothing when you let go of your suffering and pain apart from your misguiding and unhelpful beliefs and perceptions. Try not to over think everything because when you worry you create a negative experience in the future. Let life flow naturally and effortlessly, each time you worry about something you create a new negative neural connection which causes you to fear the thing your worried about even more. Learn to forgive yourself for all your mistakes then let the past go, take up more hobbies and interests, read and learn more doing anything that takes your mind off yourself. Give your mind something creative and constructive to work on instead of all that worrying and self consciousness. Give up thinking about yourself unless you are viewing yourself and your life from a positive perspective. Self consciousness can make you over sensitive, it can effect how you perceive and react to the world around you perhaps you may feel like everybody's judging you but the real truth is it is you who is your biggest judge and inner critic. If your self conscious and introvert you probably worry how you come across socially, you are probably worried what others think of you, but ask yourself this question? How much time do you spend thinking about how other people are doing or performing. The chances are you spend very little time thinking about others because you're thinking time is all geared about yourself, this applies to everybody else, they are more wrapped up in their own concerns and life and nobody will give you a second thought. We are all social creatures and we want to be confident, but being to self aware of yourself and how you come across can lead to stress and anxiety, first accept who you are, be yourself then work on improving your confidence. To much self consciousness can make you feel awkward in the company of others it can affect how you behave causing you to monitor how your doing and feeling all the time causing you to turn inwards on yourself. The less time you spend monitoring how your doing and feeling the better you will perfrom socially and the more you will flow freely and naturally. Self consciousness is strongly linked to social anxiety where you try and second guess what you worry might happen. Self consciousness can make you introvert to such a state you become scared to say things in social gatherings or you fear what others might say about you or too you. If that is not bad enough for you to deal with you may even become conscious of how you look. Being self conscious not only makes you feel lousy it can also severely limit your social confidence and social skills. There is a much better place to be than being stuck inside your own head on a merry go round of distortions and exaggerations of the mind where you live an internal existence of fear, distress and worry. Always remember our self perception of ourselves in relationship to the outside world is usually grossly inaccurate and unhelpful. You can be who you wish to be and to start that process into motion all you have to do is make a choice. Start to look out of the window of life and look outwards into the reality beyond your inner world of torment, stop observing and becoming over engrossed and negatively stimulated by your over active and misguiding imagination and start living in the eternal world of abundance, opportunities and entertainment which is now available for all of us to enjoy. What has been happening is you have been viewing your reality based on the perceptions of your imagination and you believe everything your imagination puts forward to you as being real and true. Our imagination is very powerful but it can give a miss-guided representation of the world, take your dreams for instance they are a creation and fantasy of your imagination but they have no grounds in reality and you don't take any notice of them. The same principal should apply in your waking life, but unlike the dreams you probably spend half your day observing your imagination and responding to it with fear, stress and anxiety and you are falling for it every single time even though the movie your watching through your minds eye is based on things that have not even happened or they images and thoughts are totally blown out of proportion with the real truth and your reality. You could be the most nervous, anxious person in the world through your own self consciousness, you can spend your entire life worrying about yourself and how you look and come across socially. But do you know what, you will have wasted all your time and energy because no one else will have a clue to what's been going on in your inner world and no one will really care, so the real problem is your own battle with yourself, we are our own worst enemies, your negative ego is preventing you from becoming that outgoing confident person you're seeking to be. Self-consciousness is sometimes closely related to shyness and social anxiety; self-consciousness is where you have an intense sense of self-awareness. Shyness and self-consciousness are linked to feelings of acute embarrassment, feeling inadequate and socially and personally insecure;which is often down to a lack of self-confidence and self-belief in oneself and your abilities. People who are self-conscious spend far too much time focused inwardly on themselves and are too preoccupied with what others think of them, being judged and how they are coming across. Self-consciousness can evoke unpleasant feelings of anxiety and embarrassment; those who suffer with self-consciousness are often too sensitive to how they look and how they perform socially. Self-consciousness can limit your social skills and make you too self-aware to trivial mistakes or small imperfections, you can spend far too much time constantly monitoring yourself and trying to anticipate and second guess what might go wrong, making you terrified of embarrassing yourself, showing yourself up or making a mistake, just remember no ones perfect. Be yourself, you don't have to impress anybody including you own ego, self-consciousness can destroy your confidence and prevent you from being spontaneous, you may doubt and question that what you are saying is not good enough. Do you hold back when deep down you want to join in more with the conversations through fear so you don't say what you want and you don't express yourself enough. If your self-conscious and shy you may have trouble looking people directly in the eye and it can make feel uncomfortable being stared at. Self-consciousness is often a result of an overactive imagination, when you suffer with being too self-conscious you can spend most of your time imagining what can go wrong turning you into a would be psychic by trying to predict the future or what people are thinking. When you are constantly imagining the worst case scenario all time you will create sensations of fear and anxiety, self-consciousness can cause you to blow everything out of proportion everything becomes over exaggerated and the end of the world. When you become self-conscious you can dread being in the spotlight or being made the centre of attention, shyness and self-consciousness makes you fear being put on the spot or forced to speak about yourself in front of others, self-consciousness is also usually associated with insecurity in social interactions. This can make you dread social gatherings when you are self-consciousness the mere thought of being put on the spot can cause sensations of fear and anxiety; when it does happen it can cause you to panic and focus inwardly putting all your attention onto yourself. The feelings can be overwhelming and cause extreme bouts of embarrassment and self-consciousness.This can lead the sufferer to go to drastic lengths to avoid drawing attention onto them and they can dread the thought of being put in the spotlight. Once you have become self-aware in a stressful situation it can be very hard to focus your attention off yourself again and return to a more relaxed state of mind. Try and focus your attention off yourself more, when your buy yourself practice focusing on an external object or thing, see if you can focus on that object for fifteen minutes it will take practice but the next time your in a social gathering and you turn inwards on yourself just pick some thing in the room to focus your attention on until you return to a calm state. Sometimes self-consciousness can be a result of a negative experience which is running in the subconscious mind and evoking and fueling feelings of anxiety and anticipation. Sometimes it can be from the pressures to look good in our modern day society, perhaps you are not happy with certain parts of your body, hair loss, spots or your weight. It's important to accept yourself for who and what you are including any imperfections or weak points which you may consider yourself to have, learn to love yourself. Self consciousness can leave you feeling inferior and anxious, but with a little effort you can learn to tame your imagination, stop caring what others think, stop focusing internally on yourself so much and you can train yourself to think and act natural again by using this short but highly effective session. To start too overcome your self-consciousness you need to unconditionally learn to like and accept yourself completely. It's important to accept yourself for who and what you are including any imperfections or weak points which you may consider yourself to have, you can still wish to improve but at the same time accept and love yourself. Learn how to stop being so hard or self-critical about yourself, try not to care or bother about what others thing or say about you, and stop presuming others are right, and just try and be yourself and stop trying to hard to impress others. To begin to start to overcome you self-consciousness you need to shift your focus of attention and awareness off yourself and how you are feeling and concentrate on something else, when you keep on focusing inwardly you will induce adrenalin and generate feelings of anxiety, this makes the art of socializing very difficult because you will be too engaged in how you are feeling or what someone might say about you. The imagination is a powerful tool, its primary function is to design and create, without it there would be no technology, art, music, story books, films and everything else which the human species has designed and brought into physical reality. If we don't use our imagination for its intended proper function which is to create and turn it inward on ourselves we can end up living a life of fear, stress, worry and feeling self-aware and introvert. Far too often we let our imagination run on auto-pilot, if you have read the article above about shyness you will know that we tend to trust our imagination far to much even though most of the things we envisage will never happen or if they do they never cause us any harm whatsoever. Yet we still let our imagination create endless scary scenarios in our mind which are followed by sensations of fear, worry and stress. Why this happens is because it has not got anything else more worthwhile and better to do. It may be helpful to try and take up new hobbies and interests, the more time you spend focusing on creative and constructive activities and planning, the less time you will spend worrying about yourself. You need to keep the mind occupied; you can't stop thinking so you need to shift your thinking to more constructive and useful things which are going to benefit you. You can try writing a book, designing a website, take up photography or anything which keeps you creativity stimulated in a positive and beneficial way. If you are self-conscious about your appearance ie; looks, weight, parts of you body you can try and improve on the things you can change and accept the things which you can't. If its anxiety and fear in social situations which is making you self-conscious then you need to learn some distraction techniques to shift your attention off monitoring how you are feeling or trying to second guess and predict what others might say or what you anticipate might happen. At the first signs of any discomfort or imaging things happening which you are dreading might happen; try and think about something else, you could think about things that make you happy or feel good, you could focus on past happy memories and times or think about a hobby or interest. Try and concentrate on something optimistic and positive because this will put you into a positive emotional state, when you become self aware of yourself you will cause negative resistance, this is because you are thinking about things you don't want. We become introvert and anxious because we are two inwardly focused on our perceived weaknesses and insecurities, the less attention you give to negative thoughts and feelings the less problem you will have with them. The best way to ditch fear is by keeping in a feel good relaxed state, you do this by continually practicing to think better feeling thoughts. 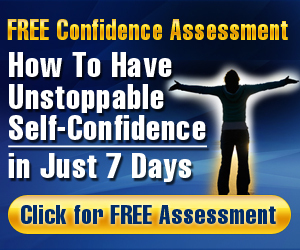 Build your self confidence and self esteem levels. You're anxious because your looking into the future and seeing everything going wrong, once you know why you feel and think the way you do then you will know what you need to do to change your state. Some people focus on objects in the room, practice paying attention to what others are saying or focusing on what you are saying. Sing or hum your favorite upbeat tune or melody to yourself, or come up with your own distraction method imagining you are some where relaxing will calm you as well, engage all five of your senses, it may take a bit of practice and effort but you must stop focusing inwardly on yourself.